Aulus Vitellius was a Roman Emperor who reigned for eight months in 69AD. Vitellius is described by the writer Seutonius as “unusually tall with an alcoholic flush. A huge paunch and a somewhat crippled thigh from being run into by a four-horse chariot.” The bust of Vitellius is on display in Abbot Hall Art Gallery and is believed to be the work of the Victorian architectural sculptor Thomas Duckett. The principle sculptor at local building firm Websters of Kendal, Duckett created a number of works from his studio in Preston. 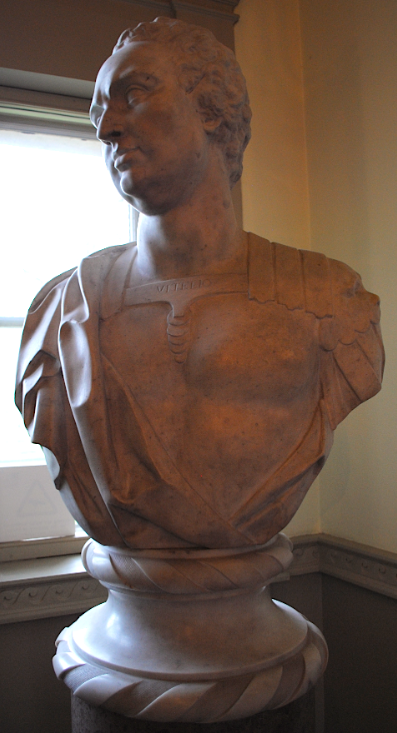 The bust is sculpted from marble and granite depicting the Emperor wearing a military robe and dates to c1850.